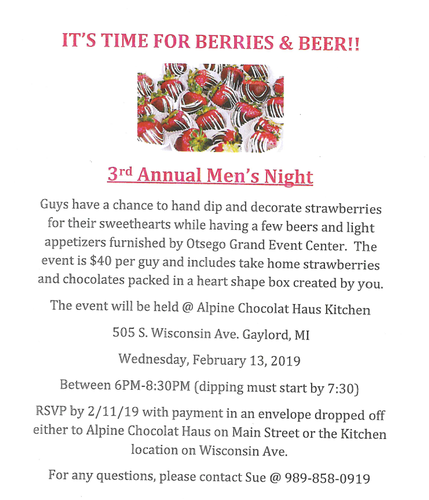 Guys have a chance to hand dip and decorate straberries for their sweethears while having a few beers and light appetizers furnished by Otsego Grand Event Center. The event is $40 per guy and includes take home strawberries and chocolates packed in a heart shape box created by you. RSVP by 2/11/19 with payment in an envelope dropped off either to Alpine Chocolat Haus on Main Street or the Kitchen location on Wisconsin Ave.